What is Full High Backsplash? In kitchen remodeling, full high backsplash is also known as full height backsplash and full backsplash. 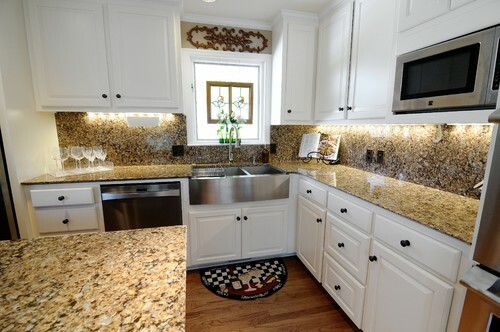 The area between the countertop and wall cabinets is covered by full high backsplash. Designers would love to make some extensions up the wall to the bottom of the overhead fan or microwave. Why Do Homeowners Pick the Full High Backsplash? Full high backsplash can be picked for picky homeowners who like squeaky clean kitchen. No grout lines for tile means a smooth surface, easy to clean. It’s hard to beat gorgeous and easy to maintain and clean all in one choice. Designers would like to provide luxury and ergonomic usage together while choosing the one piece of material. Materials usually give a smooth, accentuated look and positive energy to the kitchen. Second reason would be high power protection . Backsplashes offer a protective layer, preventing walls from moisture damage and staining – particularly behind the stovetop. If you cook regularly, consider using a full-height splash in that area. There are many good choices to establish a consistent look full backsplash. Materials can be Granite, Quartzite,Travertine, Quartz, Marble, Engineered Stone ( Manmade stone ) ,Glass, High Gloss Wood Panel,Stainless Steel and Copper. For stone materials , one of the great benefits is less head ache while thinking about the kitchen design elements. Both designers and homeowners can hit two birds by using the same stone: Countertop and backsplash from the same slab. Backsplash selection is done. Sometimes , some stone can be used for countertop and some other stone would be inserted as full height backsplash. This is all up to your imagination about kitchen design. 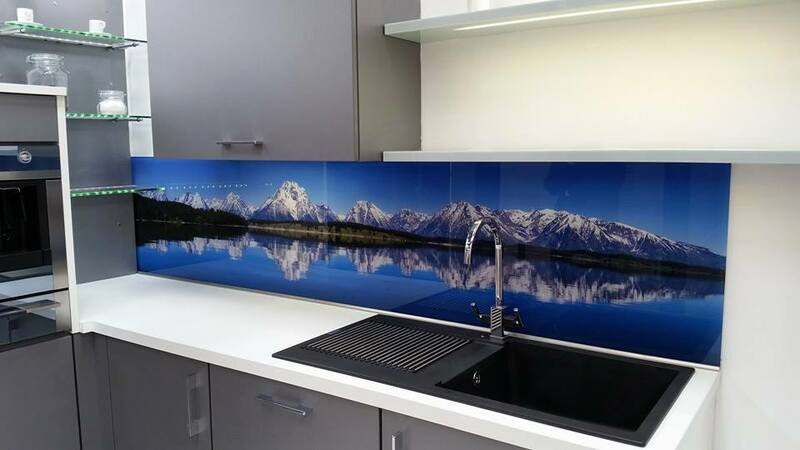 Perforated Glass, colored glass, antique mirror are being very fashionable in these days as full high backsplash. Sometimes high gloss wood panel can be used. It’s a cost effective approach over ‘painted glass backsplash’. It’s a fraction of the cost and easy to install. If splashed or stained, it’s super easy to clean. Stainless Steel, dry erase board and copper are inexpensive full high backsplash selection ideas. Please enjoy the full high backsplash pictures what I picked for you. Those eye candies will make your day. Picture Credit: Laura Hay Decor and Design Inc., Vein cut silver travertine countertop and backsplash. Neat and clean. Picture Credit: CR Home Design and K&B., Cambria Canterbury Kitchen Countertops and Backsplash. Sweet and tasty. Picture Credit: Harbourside Custom Homes., Bianco Antico Full High Backsplash and Countertop. Elegant and catchy. 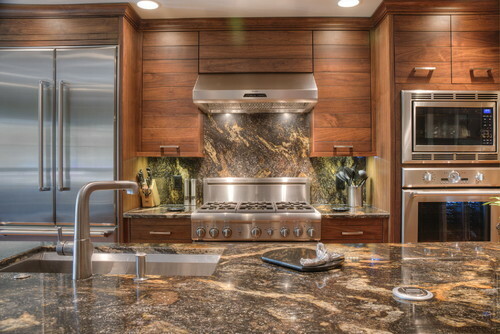 Picture Credit: Norcia Fine Cabinetry., Beautiful Titanium Granite Full Backsplash and Titanium Granite Countertop. 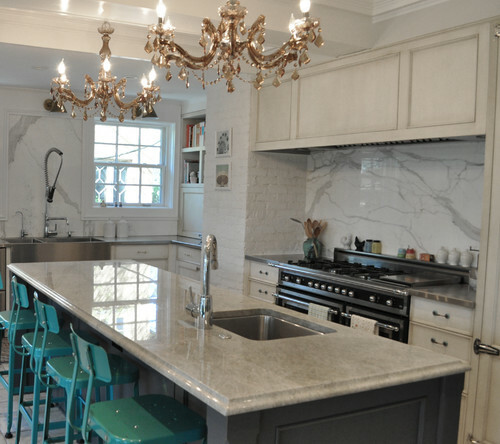 Picture Credit: John Maniscalco Architecture., Calacatta Gold Full High Backsplash and Calacatta Gold Countertop. Mesmerizing. Picture Credit: Thirdstone Inc., photographed by: Merle Prosofsky. 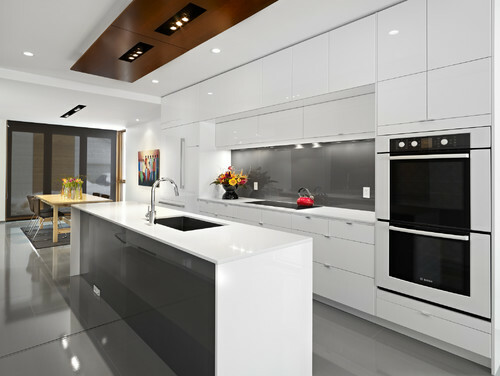 Contemporary kitchen with high gloss wood panel backsplash and countertop is “Blizzard #2141” series from the Caesarstone . Designer’s advice: You may also want to consider the “Pure White #1141” from Ceaserstone. Picture Credit: The Cousins, Antique mirror full height backsplash with turquoise rust cabinets and leathered absolute black countertop. Picture Credit: Birdhouse Interior Design., Dry Erase Board Full Backsplash. Very creative. 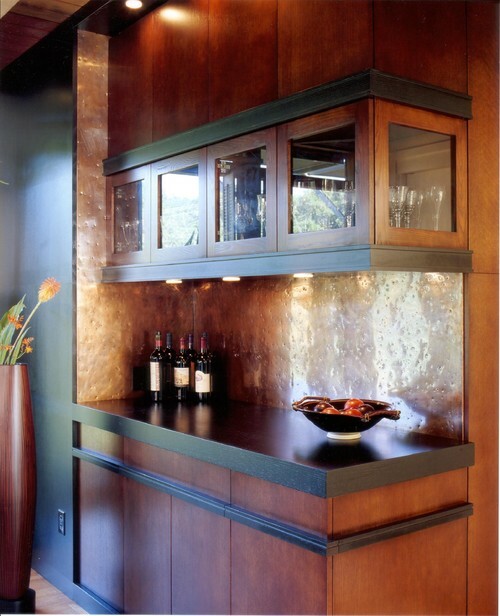 Picture Credit: Inhouse Design Studio., Hammered copper plate backsplash . Unique example of full height backsplash.